Luis Suarez has admitted that Barcelona must be ‘switched on’ when they face Valencia in the second leg of their Copa del Rey semi-final next Thursday. Barcelona are now in a pole position to reach a fifth consecutive Copa del Rey final after Luis Suarez’s winner saw off Valencia 1-0 at the Camp Nou. The Uruguayan wizard scored the only goal of the game as Barcelona won the first leg of the semi-finals and in the process, Suarez made it 16 goals in 16 games, which means that Barcelona are now just 90 minutes away from the finals of the Copa del Rey. Barcelona dominated most of the game against the rival who created very few chances but were unable to create any clear-cut opportunities to take a more convincing advantage into next week’s return leg. 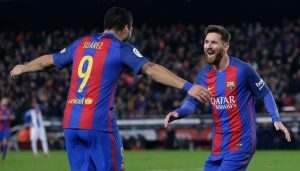 The breakthrough moment in the game came in the 67th minute when Jordi Alba and Lionel Messi worked on their way in down the left, with the latter scooping across to Luis Suarez who dived in to register goal of the match. And, with Real Madrid and Atletico Madrid both crashing out in the quarter-finals, Barcelona now also fancy their chances of winning a record-equalling fourth title in a row. Barcelona now carries a one-goal lead over Valencia when they face each other next at Mestalla. The second leg will be held at the Mestalla next week as Barcelona continue to dominate on all fronts. But the battle is far from being completed. Luis Suarez and his teammates should be at their best if they want to qualify for the finals. The post Luis Suarez Makes A Sensational Claim About Valencia appeared first on The12thMan.